Accounting as easy as 1-2-3! Do you know the difference between FIFO and LIFO? Can you use the word dilutive in a sentence? Does the phrase "amortization of bond premiums" mean anything to you? No one said the journey to becoming a CPA is easy--but with Intermediate Accounting DeMYSTiFieD as your travel companion, you're guaranteed a smooth ride. 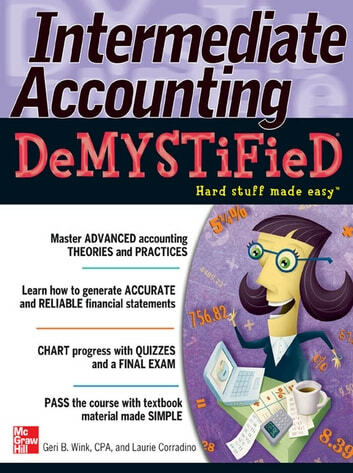 An easy-to-use self-teaching guide that reviews and expands upon core Generally Accepted Accounting Principles (GAAP), Intermediate Accounting DeMYSTiFieD covers everything you need to ace your exams and take a big step toward the career of your dreams. The book provides a fresh review of all the basics, so you can easily glide into more advanced principles. You'll learn how to generate accurate and reliable financial statements, maintain proper internal controls within a company, and locate international accounting standards. Simple enough for a novice but challenging enough for a veteran CPA, Intermediate Accounting DeMYSTiFieD is a shortcut to decoding key accounting concepts and principles.